Big food brands are iconic in North America’s cultural story. Oreos with milk remind us of childhood friendships, Kraft Dinner is the perennial college student meal, and Betty Crocker cakes? Birthdays. However beloved, they are products of multinational companies in the food and beverage industry, appearing to be stuck in their ways, and therein lies the potential for their demise. Big food brands must embrace change to remain relevant. Consumers are concerned with the health impacts of processed foods, and the environmental impacts of food production and distribution practices. Society is embracing plant-based eating, for example, and big food brands need to respond to shifting consumer needs. How did big food brands become so successful in the first place? Big food brands were initially successful because they offered product safety, availability, and convenience. The story of Kellogg’s cereal, one of the first big food brands, is a good example. Here we have a new kind of breakfast: one that didn’t require cooking, had a consistent taste from box to box and was easy to find and purchase. The food itself was a dry good, stored well, and non-perishable. It was a reliable and safe choice in a time where food safety standards were less strict and consumers more likely to experience food-borne illnesses. Big food brands wouldn’t have prospered without being widely available, so the rise of the supermarket was well timed. Founded in 1915 in Manhattan, the Astor Market offered a one stop shop for meat, produce, fruit, and flowers. It was one of the first markets to offer several perishables in one place, introducing convenience by removing the need to visit separate markets for each. By 1954, supermarkets accounted for 41.3% of grocery sales. They were the ideal place for brands to build a loyal following, and they had the distribution and marketing dollars to do so. In the 1950s and ‘60s, big brand product recognition was so high that the brand names of many products replaced their generic ones, such as ChapStick for lip balm, BandAid for bandages, and Kleenex for facial tissue. Big food brands had their peak penetration in the 1970s and ‘80s, and since then, there’s been a decline in consumer commitment. Now consumers want big food brands to match their lifestyle and values. To understand the decline in the supermarket’s share of grocery sales, consider how our motivations have changed. Consumers have fewer worries about safety, consistency, and availability— perhaps we simply assume we can get what we want, when we want and that it will all be safe to eat because of our well-established food safety regulations. Consumers are demanding a different ethos in their big food brands. Today, consumers increasingly value the origins of a food product and its ingredients, and the values that inform the brand, its company, and the supply chain. To prove the point, look to the widespread movements that encourage consumers to buy local, to buy Fair trade and to buy product with less packaging. Consumers are influencing brands to be transparent —and live up to the consumers value system, not their own. 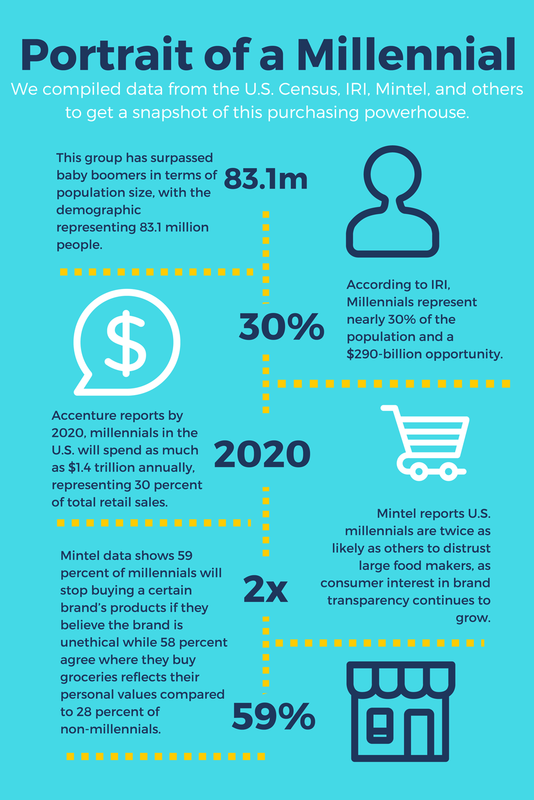 Industry research tells us that the Millennial grocery shopper is paying more attention to social callouts, including product narratives and origin stories. Globally, 66% of consumers are willing to spend more on a product if it comes from a sustainable brand. Millennials gave an even more impressive showing, with 73% of surveyed millennials indicating a similar preference. Additionally, 81% of millennials even expect their favorite companies to make public declarations of their corporate citizenship. Where else do we see this kind of messaging? Startups. A common startup brand strategy embraces messaging that emphasizes the person as a unique individual. The spokesperson of the company is often the founder, and the story is usually about them, sharing why they started the company, their vision, mission, and goals for the company, and their credo for customer service. Big food brands don’t generally have known origin stories, or values, or even personality – for the most part. It is our opinion that they need to humanize their brands to recapture consumers who have become disillusioned with the food and beverage multinationals. This is where brand strategy comes in. Use brand strategy to humanize the big food brands. Humanizing a big food brand begins by establishing a relationship with the consumer and giving them a reason to latch on to more than the product. The consumer should connect with the personality and values of the brand. The brand should show traits of empathy, approachability, and transparency. We would suggest using words about people, perhaps humor and maybe even fun. Success in any business or industry is built upon a sound strategy that evolves over time. Change is a reality that every type of business must deal with and big food brands are no exception. They must adapt to the times or risk being left behind.